Product Use : Nighttime relief and protection for dry eyes. Strong relief for dry, irritated eyes. This product is currently out of stock. We apologise for the inconvenience. Please check back at a later date. Nighttime relief and protection for dry eyes. Strong relief for dry, irritated eyes. Refresh Night Time Eye Ointment has been specially formulated to soothe, moisturize and protect dry, irritated eyes. 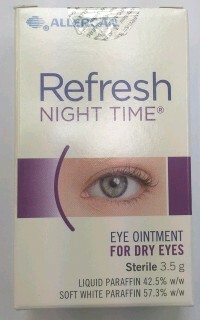 Refresh Night Time Eye Ointment is ideal for use at bedtime. Just as important, Refresh Night Time Eye Ointment is preservative-free to avoid the risk of preservative-induced irritation. For the temporary relief of burning, irritation, and discomfort due to the dryness of the eye or exposure to wind or sun. May be used as a protectant against further irritation.Pull down the lower lid of the affected eye and apply a small amount (one fourth inch) of ointment to the inside of the eyelid. Replace cap after using. For external use only. To avoid contamination, do not touch tip of container to any surface. Replace cap after using. Stop use and ask a doctor if you experience eye pain, changes in vision, continued redness or irritation of the eye, or if the condition worsens or persists for more than 72 hrs.portant notes.Store away from heat. Protect from freezing. Use only if imprinted tape seals on top and bottom flaps are intact and clearly legible.